Malden’s PHO Bistro Earns Best of Boston Award! Malden, Mass., August 3, 2016, — Mayor Gary Christenson congratulated Malden business PHO Bistro on winning a Best of Boston Award. The downtown Malden eatery serves a wide variety of pho and other Vietnamese specialties. (From left) PHO Bistro Manager Tam Mai, Mayor Christenson and Manager Quang Vo. 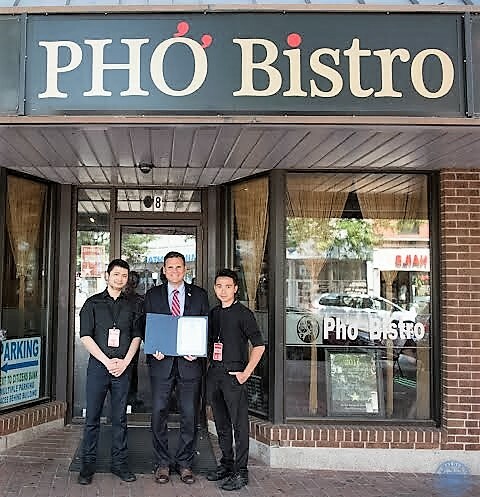 Mayor Christenson presented a citation to owner Brian Nguyen commending Pho Bistro’s accomplishment. Congratulations!